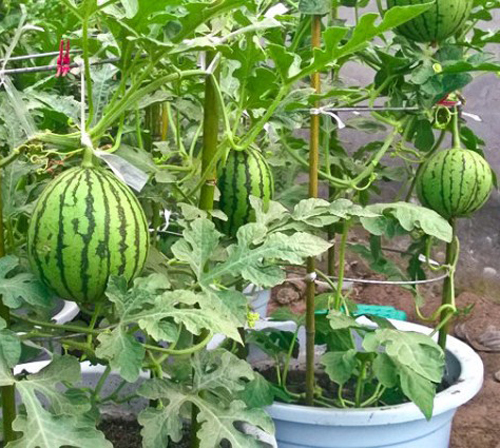 Growing watermelon in garden containers allows this big, sweet and juicy fruit to grow in the smallest of spaces. Sweet and watery melons are without a doubt an iconic summer fruit that everyone loves. When potted, they are perfect for apartment dwellers where all you have is a small balcony to plant on. Place the potted plants on a patio or next to a back door where you will have easy access. Here are a few tips. It's best to start from seeds since the plant doesn't like to be transplanted. Since the roots are long choose a pot that is deep. This is not the time for a garden bowl or wok shaped pot. Try to make it at least 2 feet deep and as wide as possible. Place the pot in a sunny spot. Where space is tight use a trellis. Make the potting soil sandy and loamy. Avoid compact or clay soil. 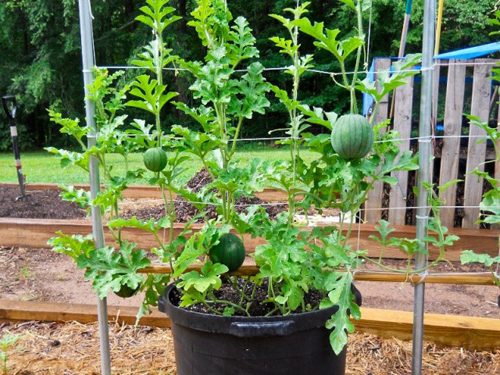 Potted watermelons require a lot of water of keep moist but not wet and make sure the pot has a drain hole for run off. Once the fruit starts to swell and mature reduce the watering. Fertilize with liquid fertilizers, prune side branches and any damaged leaves. You should have watermelons in about 90 days. Tap the side of the melon to hear a hollow sound to know when fully ripe.